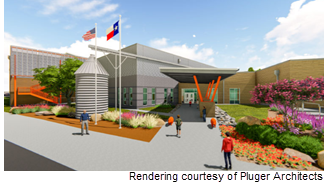 ​​​​​ ​HUTTO – A new 108,000-sf elementary school is breaking ground in Hutto ISD. The school, currently called Elementary School No. 7, ​will be constructed on the northern part of a tract of land east of the Siena neighborhood and south of Green Haven Ranch. It will be the largest elementary school in the district with an estimated cost of $25 million, according to the Texas Department of Licensing and Regulation. HISD recently adopted a project-based education method, and the new school was designed to include collaborative spaces that support that strategy. The school is expected to be complete May 2019.